Wilkes-Barre PA: Return to Glory! The City's Return to Glory Begins With Dreams and Ideas! Brian Kelly's 58th book helps Wilkes-Barre residents know that their City can come back! Those who followed the recent Wilkes-Barre Mayoral race know that Brian Kelly of Wilkes-Barre was one of four candidates on the ballot in the Democratic Primary. Thinking about how to differentiate his candidacy, Kelly thought deeply about what it would take to turn Wilkes-Barre, unfortunately a dying city, into something special again. Kelly wondered how his mayorship could help make Wilkes-Barre into a great city again? As he recounts talking to many people about his plans, few felt Wilkes-Barre had much of a chance. Yet, most were happy Kelly thought that good things could happen with good leadership. Brian Kelly devised a lot of notions about how Wilkes-Barre could return to its former glory. He wrote them all down. Additionally, Brian thought of a number of stories from his own life from childhood on. These stories highlighted the wonderment of this City, and he wrote them down also. Brian Kelly has written sixty-one books so far in his short life. Feel free to go to www.bookhawkers.com if you would like to claim one of these books for your personal library. I bet you'll like it! Books are presented in this article in last to first sequence. I write so much one of my biggest challenges is deciding which of my many web sites should contain which content. Unfortunately for me, this web site, which is a summary site of all of my work has not been updated for about a year as I have been writing for other purposes and storing my stuff on those sites. On June 18, 2015, I changed this. If I had just one employee life would be especially easy. Read more: Tell me More About BK's Writings and Works! There is good stuff on the Brian W. Kelly site! Who is Brian W. Kelly? Among other things, Brian W. Kelly is a former IBM Senior Systems Engineer and college professor. Kelly ran for office recently so that Wilkes-Barre could have a Mayor from outside the current political system. Kelly's campaign platform included making the city more open and friendly to business and making Wilkes-Barre a safe, affordable and clean city. Brian Kelly and his many ideas for a better city were soundly defeated on May 19, 2015. This is Brian's personal site in which he blogs many of the patriotic articles and letters to the editor that have been published by various sites and media outlets. Read more: There is good stuff on the Brian W. Kelly site! BRIAN W KELLY SCHEDULES PRESS CONFERENCE ABOUT POSSIBLE MAYORAL RUN! Brian W. Kelly, the number one published conservative book author in America, may be putting down his pen in favor of a new career in politics. Kelly's 56th book, Geoffrey Parsons Epoch... The Land of Fair Play, was released just last month and is available online at www.bookhawkers.com. Kelly is considering a run as a lifetime Democrat for mayor in his hometown of Wilkes-Barre, PA. The 66-year old author and retired professor has scheduled a press conference for 5:00 PM Friday November 14, 2014 at Keats' Pub, 115 Bowman Street, Wilkes-Barre, PA. All NEPA Media Outlets are invited and the general public is welcome as Keats' Pub will be open for business as usual. 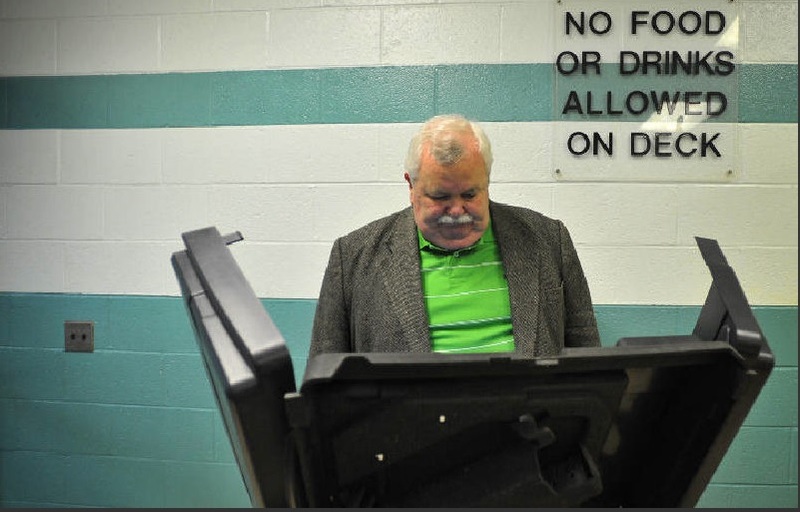 Brian Kelly casts his vote at the Kistler Elementary School polling site Tuesday morning May 18, 2010. 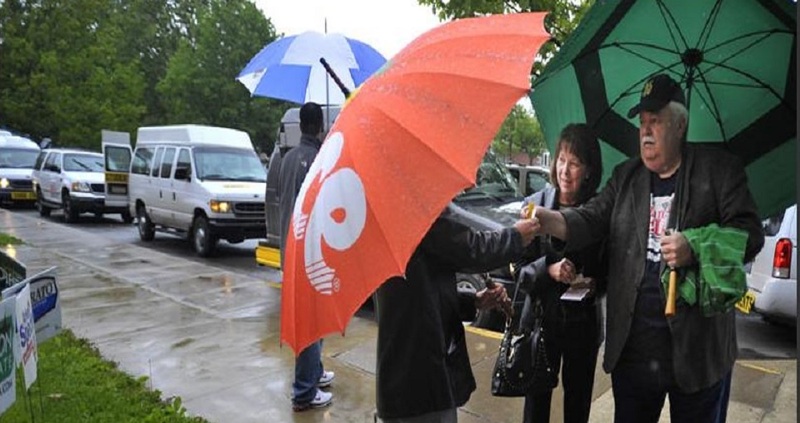 WILKES-BARRE, May 18, 2010, Times Leader: – Brian Kelly wasn’t even at the first polling place for a minute before he cracked a joke. In the recent election, the grey haired brigade stood fast and voted to help put America back on the path of our founding. This email cam by my desk and it helps in giving us the right perspective of the world we live and it offers a lesson to millenials to not write off the members of this brigade, ans we, more than anyone in government, have the backs of the young. You are aour sons and daughters and our nephews and nieces,, or students and friends. We simply love you and we are old enough to help protect you even though you think you need none. Read more: The Grey Haired Brigade Is On Duty to Help! Brian Kelly is on the far side of the page heading picture while celebrating his run for Congress in 2010. The kind models in the picture posed free of charge. Aren't they a good looking crew? They are really Brian's neighbors and friends who came out in droves on primary election night May 2010 to cheer him on. But, they do look like they could be models. A lot of others who were at the event could not fit into this picture. On the far left for example, you would find Carol and John. On the far right, Mark and Brian from Marywood. With a full picture, Joe and Di would be discovered. It was a wonderful showing and Brian was especially thrilled when results were announced for White Haven PA. When White Haven called in, Mr. Kelly started the evening with a commanding lead. Though he lost the Democratic Primary election in 2010, for his first and only foray into a political race, he was honored with 17% of the vote. Read more: Who is Brian W. Kelly? Welcome to Brian Kelly's Website. For the last five years beginning with his book titled: Taxation Without Representation, Brian Kelly has been writing powerful patriotic books and articles to help educate the public on the issues of our times. The purpose of this site is to host Mr. Kelly's work and make it accessible for all to read. Links will be provided for many of Brian's books so that if you are inclined you can purchase them online from various sites. Additionally, previously published articles will be provided both in link form and in text form for reading from this site. Other than in the past on a professional basis, when he wrote highly technical articles about IBM's AS/400 computer system, Brian Kelly receives no compensation for his work. If you would like to help Mr. Kelly in his efforts to continue to write free patriotic articles and to write additional patriotic books for the good of America, feel free to visit www.bookhawkers.com to purchase Mr. Kelly's patriotic books. His books include, Saving America, the How-To Book, as well as America 4 Dummmies. Thank you for your support. Additionally, Mr. Kelly has submitted many pieces to the Times Leader, a local NEPA news source. The Times Leader cannot print all of the articles submitted to their readers' column by Mr. Kelly ofr others would not have the opportunity. And, so, check out the main menu right on this site and pick either the published or unpublished articles and you may find yourself enjoying them. The Times Leader offerings are substantially smaller in size than those submitted as essays to national outlets. Perhaps Tom Leighton and Wilkes-Barre's City Council, along with the City Administrator and the City Clerk, could learn from the many examples out there of Mayors not overburdening citizens with taxes that are unaffordable. I would like to see a stance against the 31% tax increase that will cripple the pocketbooks of those who live in Wilkes-Barre City. Is it not proper that all citizens ask that each member of Wilkes-Barre City Council, individually and independently, submit a proposal to balance the budget? Where is the Tony George Proposal? Where is the George Brown proposal? I am not suggesting that they merely offer their conclusion that this usurious tax increase is unavoidable. I think citizens should demand that Council, who are paid quite well for what they do, should write in their best King's English how the City can avoid the Mayor's proposal to whack us all with a 31% increase in real estate taxes. Any Council member who cannot do this should be a target for the next election cycle by the citizenry. Council should not be permitted merely to say "yay" or "nay". Council knows what its residents are looking for and they should be required to offer their best thoughts in a formal document. If a member cannot offer his or her response formally, they do not deserve to sit on City Council. Read more: Thirty-One Percent Tax Increase Was the Leighton Solution! Will there ever be unimpeachable honesty in government? Probably not! In Northeastern PA, it is clearly less likely than many other areas of the country. Can part of the problem be that the same old names and faces keep surfacing while many willing to serve are not called, not chosen, and are simply not wanted? If you don’t have the right bloodline in Wilkes-Barre; and for the most part, NEPA in general, you can count on being on the outside looking in. This legacy continues with the parking space boondoggle. 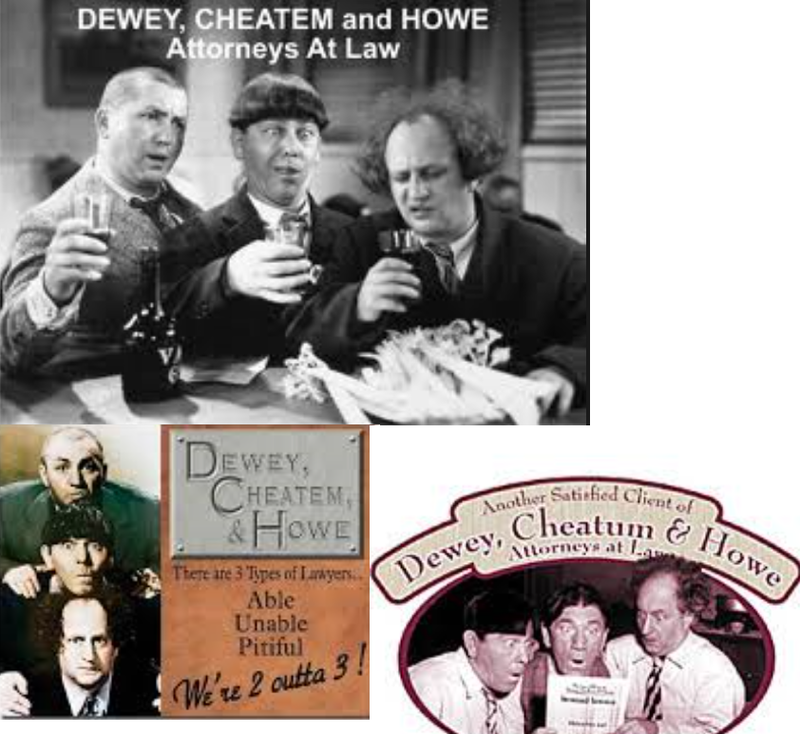 Read more: Dewey, Cheatem, & Howe: A Cut Above Fox Rothschild? This is another submission modified at the top, that the Times Leader chose not to print. I wrote this article initially for the Times Leader and posted it on another web site when I thought I might be Mr. Smith and I might be heading to Washington. But then a fine Mr. Smith, Tom SMith to be exact actually ran for the Senate. He was not a bad guy at all, and the current Senator had yet to lift a finger for Pennsylvania, and was always sucking up to Obama, I was willing to give my Mr. Smith title to Mr. Smith. Mr. Casey would be lucky to have the resume of this Mr. Smith. While officially still listed as our US Senator, Bob Casey Jr. has been MIA or fighting on the side of the enemy on important matters for Pennsylvania and America. This must end. In November, 2014, Senator Casey voted for the Keystone Pipeline. I am not sure if this was because the Democrats did not need his vote to defeat the measure but I salute him nonetheless. Next year, we will see if he really wants those of us in NEPA to be able to heat our homes or not. For the first time Senator Casey, thank you for doing the right thing. Read more: Mr. Smith Goes to Washington! I read the comments about my article and then I read my article again. I choose to stand by my words. I know that I am not among the rich but I think they pay enough taxes. Without the rich, I never would have been able to achieve a college education. If the leaders of our government continue to beat the drums of class warfare and the occupy people gain more favor than you and I and the rich, America will change for sure. It will no longer be the nice country it has been as people demand more from government. Pennsylvania Congressman Lou Barletta is as gracious as anybody that I have ever met or you will ever meet. District 11 in PA is fortunate to have a fine person such as Mr. Barletta representing our interests in Congress the past two years. As a freshman member of the Congress from 2010, Lou is doing a fine job for our part of Pennsylvania and the nation. We could use more like him in both Congress and the Senate. Not everybody likes Lou Barletta, however, and that too is good. For example, the progressive and corrupt media does not like him at all. In fact, they dislike him so much that they slant the news so that we will all conclude that the he is a one issue representative; but the congressman proves them wrong every time he votes. He votes for Pennsylvanians and the nation. Response to: Writer sends sympathies to America's super-rich! Read more: Response to: Writer sends sympathies to America's super-rich! While officially still listed as our US Senator, Bob Casey Jr. has been MIA or fighting on the side of the enemy on important matters for Pennsylvania and America. This must end. It is vitally important to undo the economy-destroying regulations of Barack Obama. We cannot count on Casey to help US because he mistakenly thinks all is well. We elect Senators one at a time and Bob Casey Jr. is up for election again. Many in my part of the state, which is also Casey’s part of the state, see the Senator as being a real dud, and more of an embarrassment than a help to Pennsylvanians. Senator Robert P. Casey Jr. has been a do-nothing, mostly invisible Senator. He has never held a real job in the private sector. His biggest failing as a politician is that he does not like the job of representing the people. Yet, right now; that is his job! Read more: Send Mr. Smith to Washington!